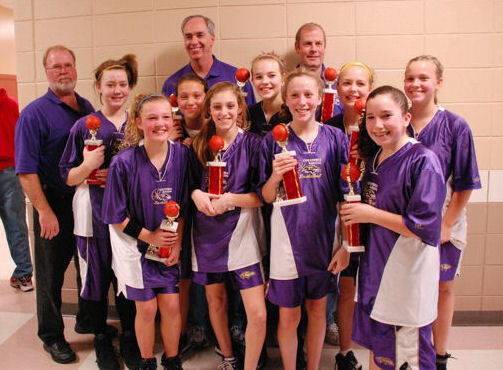 Congratulations to the Columbia Ravens 13U Girls. 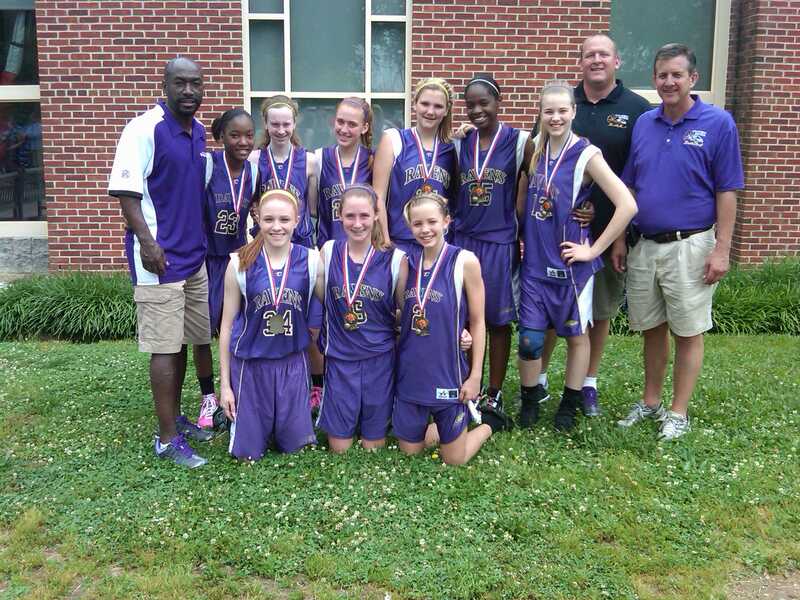 The Columbia Ravens Girls AAU U13 team competed in the Division II National Championship Tournament in Kingsport, July 17. They finished in the top 10 in the Nation, completing the season with a 29- 14 record, and was one of 3 teams from the State of Maryland to receive and accept a bid to the Division II Nationals. The team is made up of girls from the Columbia area and was making their 4th appearance in the Amateur Athletic Union (AAU) Nationals. 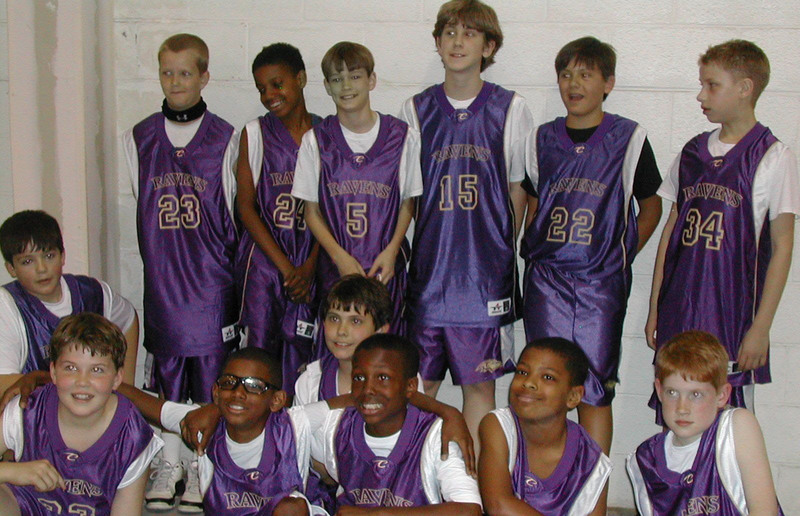 This was the first year of AAU play for the Columbia Ravens. The girls names and schools they will be playing for in the fall, from left to right, are: Brittney Davis (Pallotti High School), Michaela Battle (Good Counsel High School), Adrienne Flowers (Pallotti High School), Sydney Tommins (Notre Dame Prep), Mary Kittleman (Glenelg High School), Jodi Schneider (Mount de Sales Academy), Alauna Jackson (Howard High School), and Chizzie Ekedigwe (Pallotti High School). 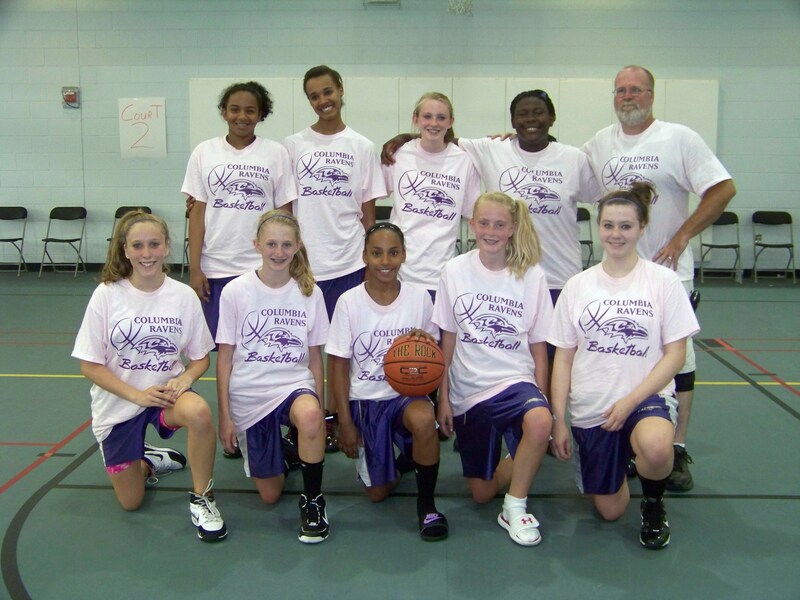 Congratulations to the Columbia Ravens 7th Grade Girls. Dennis Kelliher's 7th grade girls team win the Arbutus League Playoff Championship. Congratulations to the Columbia Ravens 15U Boys. 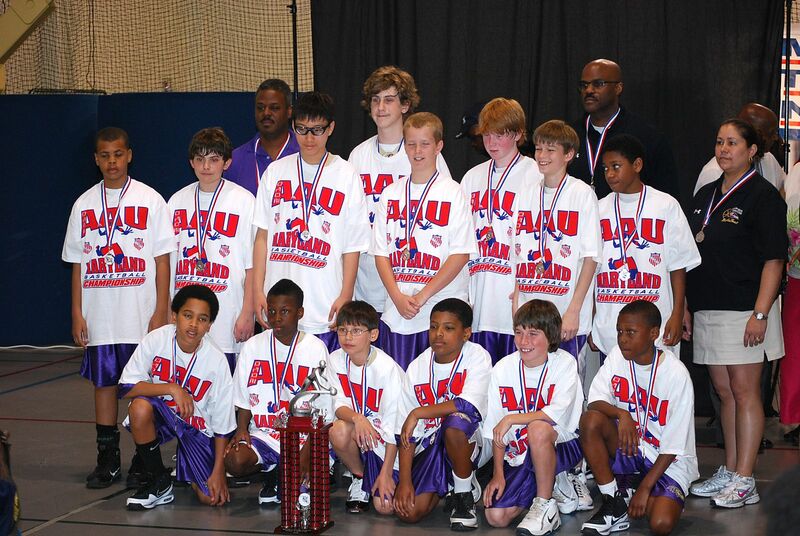 They were the AAU Super Regional Runners-up to the Baltimore Stars in the Delaware based tournament last month! They were the Ironhorse Tournament Champs! Congratulations to the Columbia Ravens 14U Boys. They finished 2nd in the Culpeper Wolverines Tournament. John Miller's 7th grade girls team won their 2nd consecutive holiday Tournament. 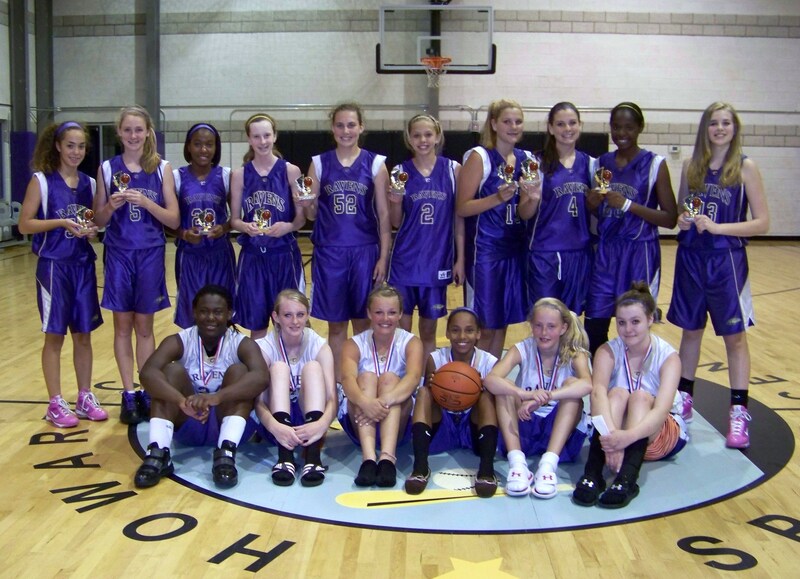 They competed in the Maryland Flames Holiday Tournament and Rising Stars Holiday Tournament. The Columbia Ravens Boys 15U team are D2 State Champs. Congratulations to all the players for a job well done. Congratulations to the Columbia Ravens 11U Boys. 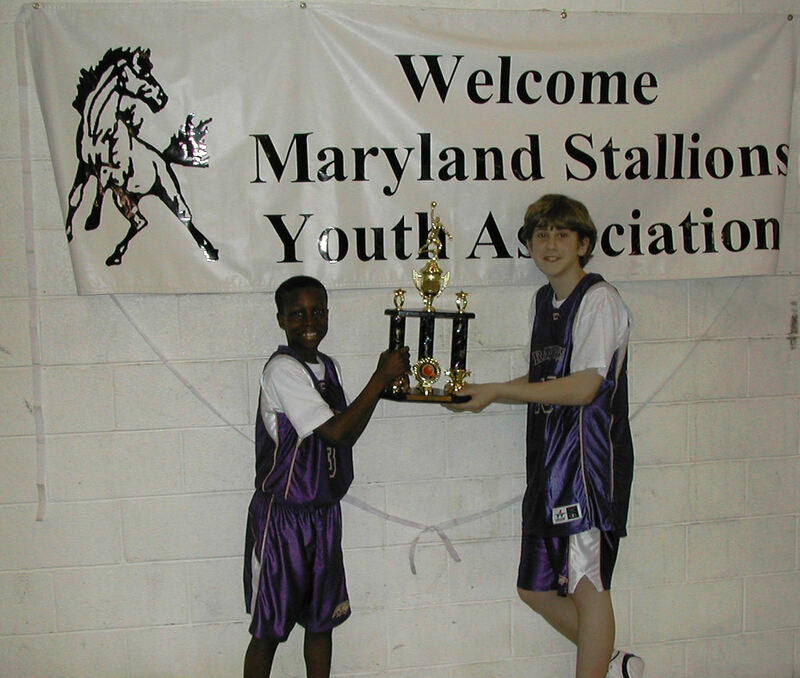 Stallions Invitational tournament held April 18th -19th in Temple Hills Maryland. Congratulations to all the players for a job well done. Congratulations to the Columbia Ravens 14AAU GIRLS. 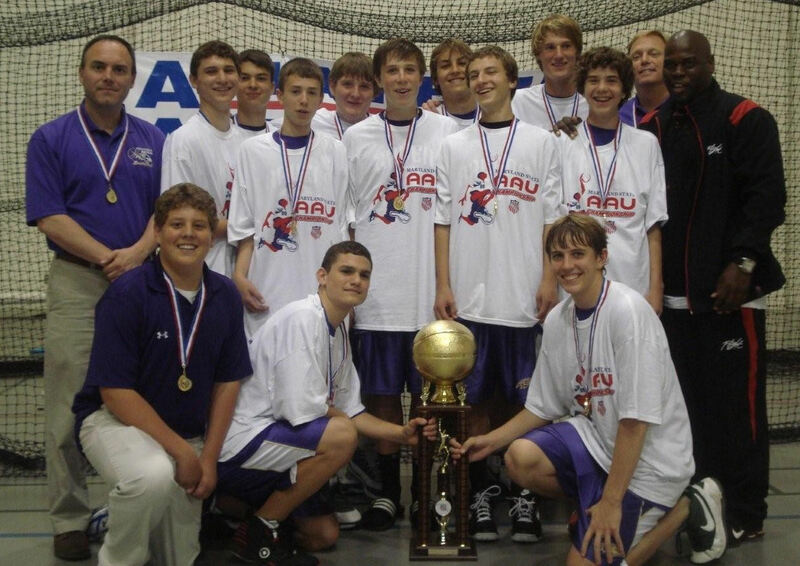 At the AAU 14U National Championships in Salem, VA, the Ravens 14U National Team became the 11th ranked team in the Nation. The tournament started out with the Ravens defeating the 5th seeded team going into the Tournament, the Tennessee Hustle, 54-44. The Ravens completed pool play in second place, beating the Acadiana Stars of Louisiana (56-53) and losing to a strong Boo Williams out of Hampton, VA (70-62). This showing earned them a berth in the Championship bracket. 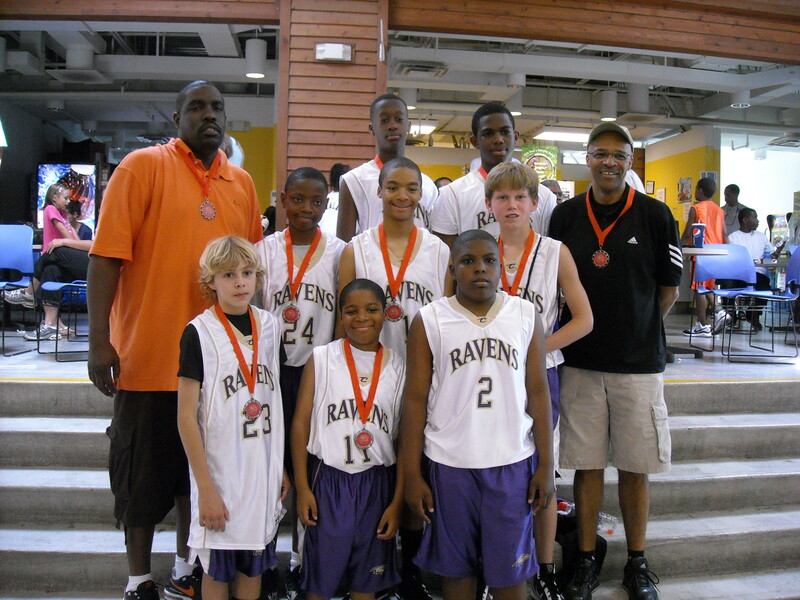 In bracket play, the Ravens opened up with the eventual National Champions, the Indy Gym Rats. After keeping a close game, down only by 8 at the half, the Gym Rats went on to win, 72-52. The Ravens next defeated the Wisconsin Prestige 74-63. The Ravens run in the tournament ended with a loss to the Orlando Comets, 45-44. We are extremely proud of how well the girls competed against the best national competition AAU had to offer. 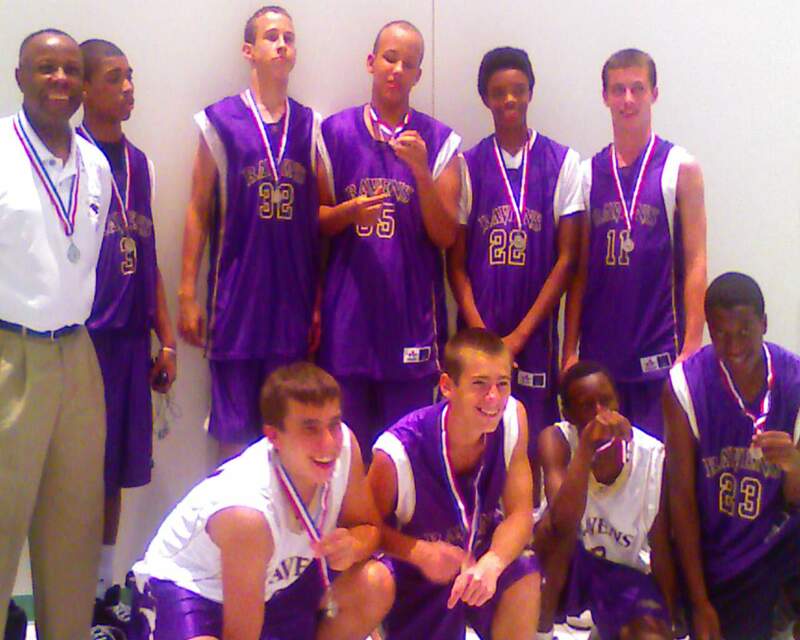 In the 2009 season, competing with 8 new players and playing a 15 and 16U schedule, the team finished the season with a record of 36 -12. 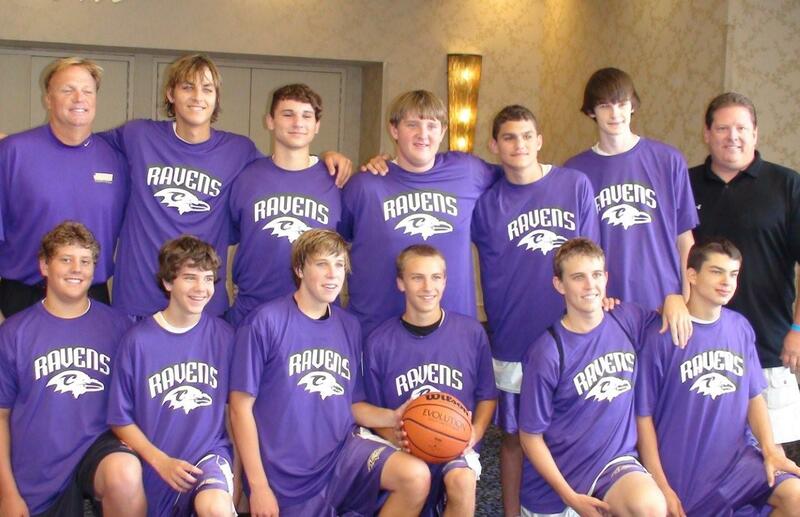 In addition to finishing ranked nationally, the Ravens also captured the bronze medal in Maryland state AAU competition, finished 2nd in the Hershey Showcase, and finished first in the Flames March Madness 15U and the Charm City Showdown 15U events. Many thanks to the Coaches Charles Jackson, Bianca Francoeur, and Newt Davis. And thanks to the families who traveled, cheered and generally had a good time. But most important, thanks to the girls for all of the thrills, fun and craziness they provided. Thanks to Michaela Battle, Brittany Butler, Mila Clark , Brittney Davis, Meagan Fowler, Jasmine Hill, Alauna Jackson, Mary Kittleman, Jordan Labbe, Tiffany Padgett, and Knowlej Randall-Thomas. Congratulations to the Columbia Ravens 15AAU Boys. 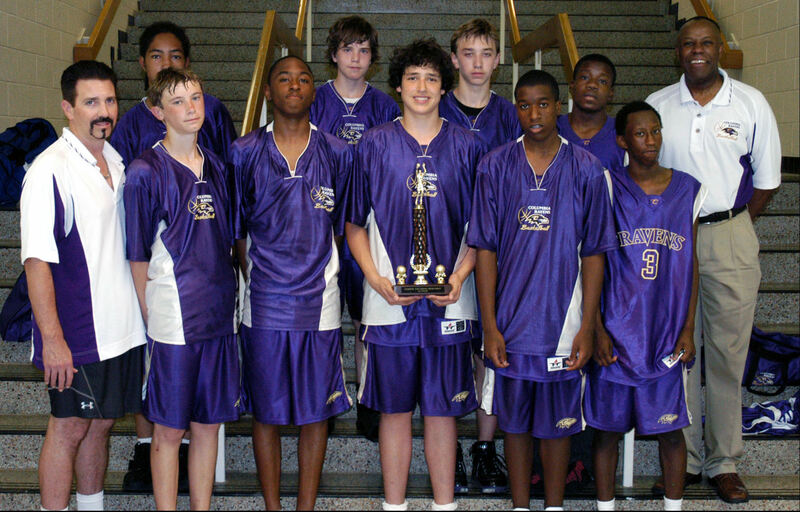 The Columbia Ravens U15 Boys AAU team won the AAU West Coast Division II Nationals on July 29, 2009 in Las Vegas Nevada. The is the first National title for the Ravens. 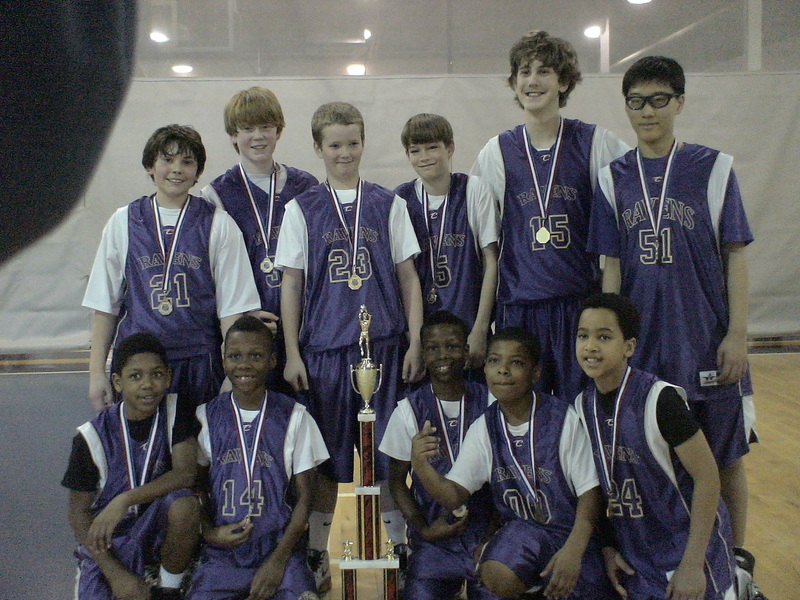 They won the championship game 73 - 71 against the Bulls from Seattle, Washington. Congratulations to the Columbia Ravens 12U Boys. They won the MD Flames Thanksgiving Tournament, Local Team Division. The Columbia Ravens finished 2nd in the Rising Star Holiday Tournament, losing to the Maryland Flames 34 - 30 in the final. They advanced to the final game by defeating the K-Town Hoyas (who was the 1st place team in pool A) 28 - 27. During the tournament the Ravens defeated Olney, The Torrent, and the K-Town Hoyas over the four day event. 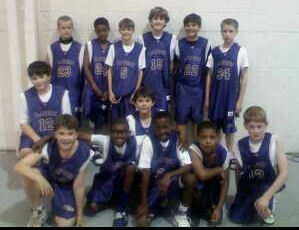 Congratulations to the Columbia Ravens 5th Grade Boys. Overcoming the elements, Columbia Ravens � 5th grade � Campbell team won the Maryland Flames Holiday 10U tournament held at Georgetown Prep January 2 and 3 by sweeping the competition of Cecil Slam, Olney Magic, and Classics and scoring an average of 42 points per game. All out effort was shown on the defensive side too. Congratulations boys for a great team performance! The Ravens 12U Boys team used stifling team defense and an overall superb team effort to go 4-0 and capture the Santa Slam tournament championship in Mt. Airy this past weekend. Congratulations to all the boys for putting forth championship level effort the entire weekend. 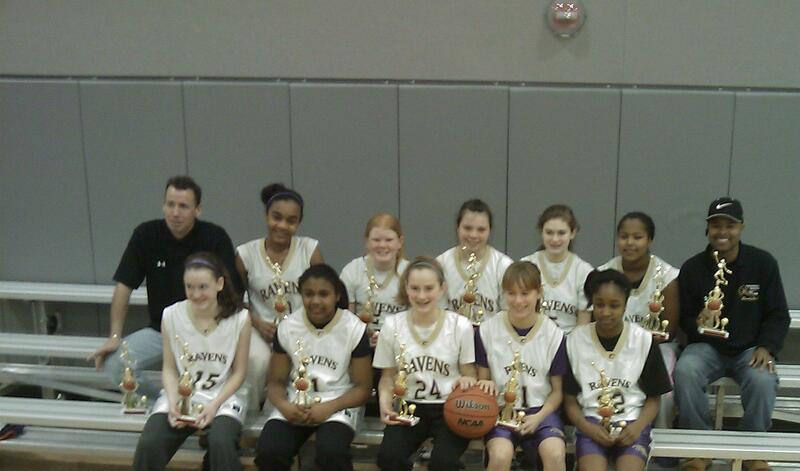 Congratulations to the Columbia Ravens 12U Girls. Columbia Ravens 12U Girls finished second in the Arbutus League. Congratulations to the Columbia Ravens 10U Girls. Coach Scott's 5th grade girls won their Arbutus League Championship (B division) against a much bigger and physical Harundale team on Sunday. (with a running clock) and came back to win 22 -17. Arbutus Championship in the 13-14B division. This past weekend, the 12U Boys team scored an impressive 42-34 win in the championship game of the District Heights Super Regional to qualify for Nationals. Every player on the roster made a contribution and the boys made several clutch plays down the stretch on offense and defense to take control of the game. Congratulations to all of the players for a terrific effort! 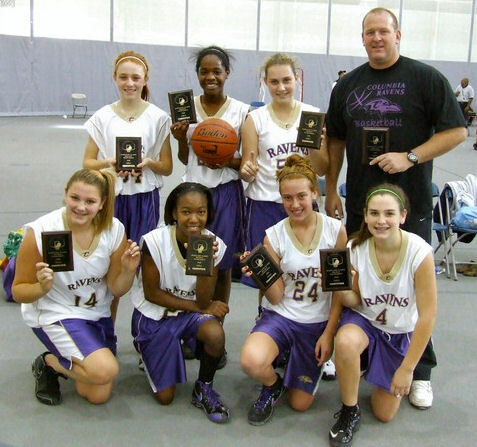 The 8th grade Ravens Girl's team coached by John Miller won the YMCA League Championship. 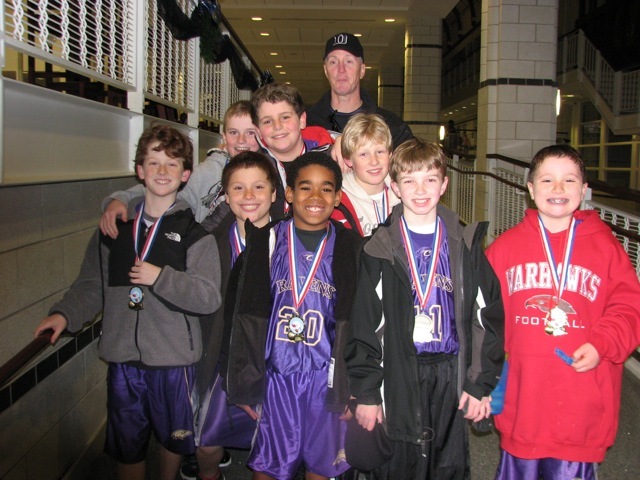 Congratulations to the Columbia Ravens 10U Boys. 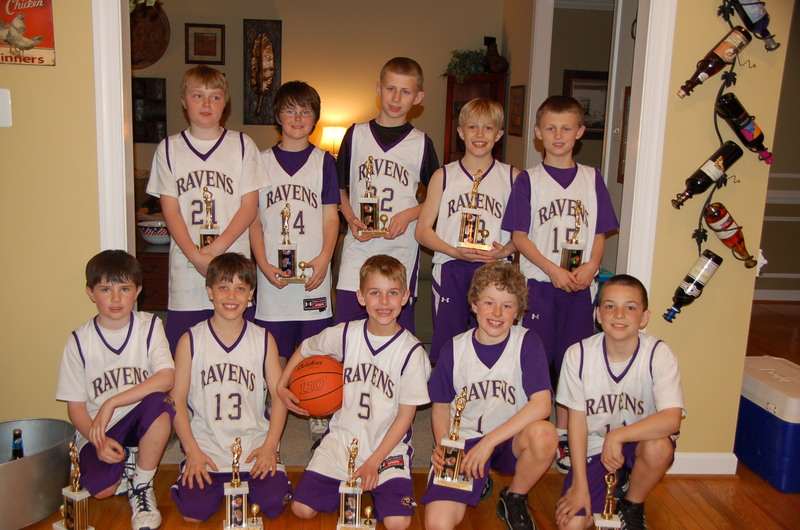 The 4th grade Ravens team coached by Dan Ingersoll won the Carroll County League Championship. They were regular season champs and won the post season tourney today beating North Carroll 36-11 in the finals. Congratulations to all of the players for a terrific effort! 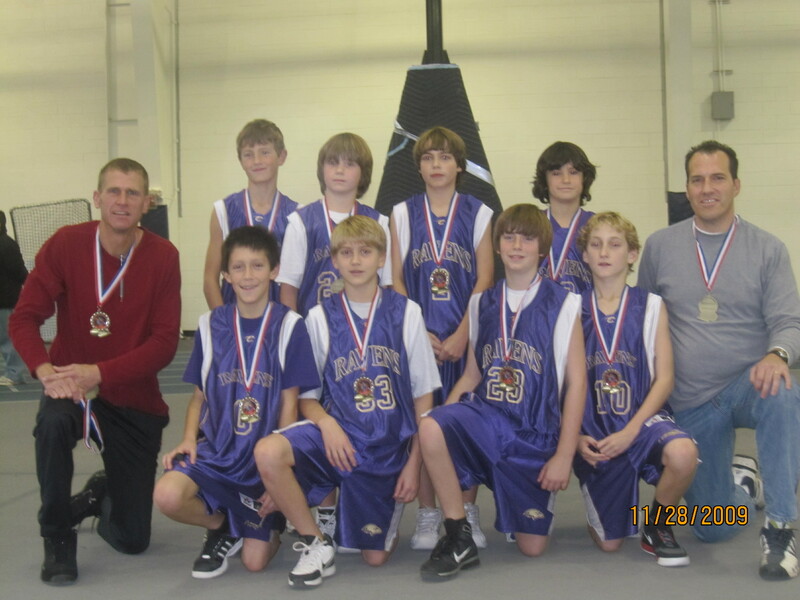 The 8th grade Ravens Boy's team won the Rising Star tournament 49-42 in a double-overtime victory over the Blizzard. It was a 35 team tournament. They finished undefeated for the season in Rising Star. Congratulations to all of the players for a terrific effort! Division 2 State Championships to advance to the championship game. That game will be played the first weekend in May at Morgan State University. effort over the course of the entire weekend. 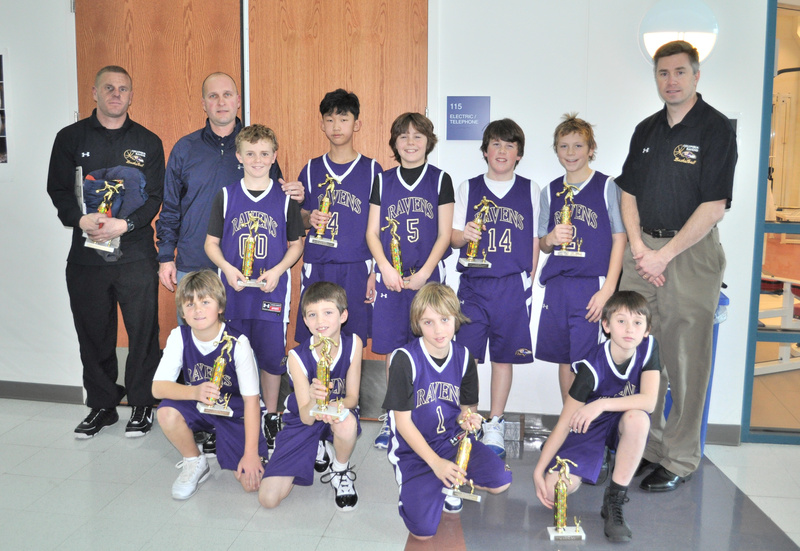 The Columbia Ravens 12U Boys team took second place in the D2 State Championships this past weekend. Considering that this was their first year competing in this event the boys did a tremendous job and should be very proud of themselves. Congratulations to the Columbia Ravens 9U Girls. The Columbia Ravens 9U Girls went 3-1 to claim Runner Up at the 2010 Battle of the Balls Bluff Tournament in Leesburg, VA. The team knocked off Frederick Wildcats 22-12, Loudon Triple Threat 36-10 and avenged an early season loss to the Maryland Hoopsters with a 30-18 win in the tournament semi-finals. After leading most of the championship game and into the 4th quarter The Ravens were unable to close out a very tough Virginia Hurricanes team, losing 24-17. The team was lead with tough rebounding by Grace Underhill, Kelsey Ellis, Kelly Simons and Selina Robinson as well as great defense by Emma Schettig, Ava Dennis and Cecelia Bartley. Leading scorers included Madison Burris, Courtney Furr and Jessica Foster. 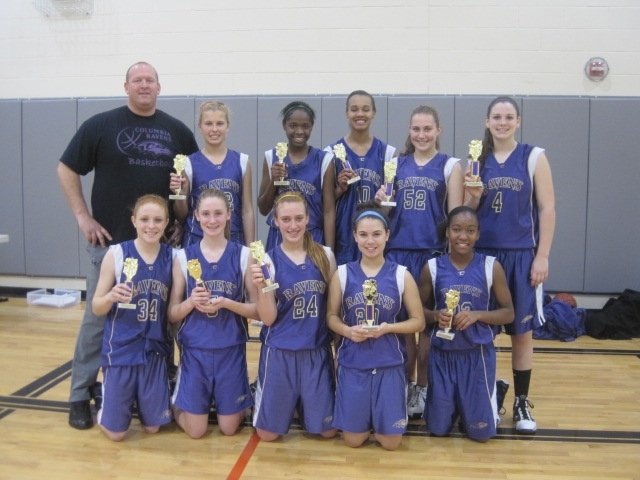 The Ravens will travel to Reisterstown for the YBOA State Championships this coming weekend. 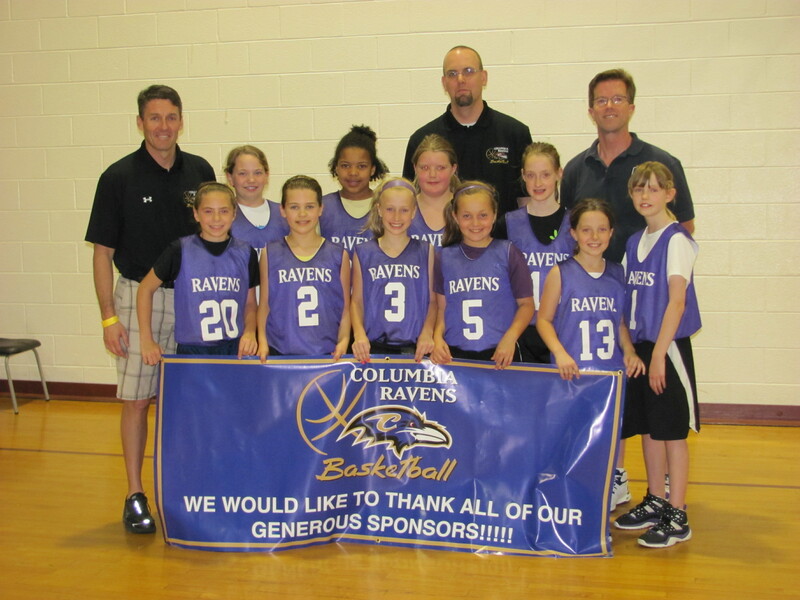 Congratulations to the Columbia Ravens 10U AAU Girls. The Charm City 2010 Adidas National Invitational Tournament had over 110 teams participate from Mid-Atlantic and Northeast areas. 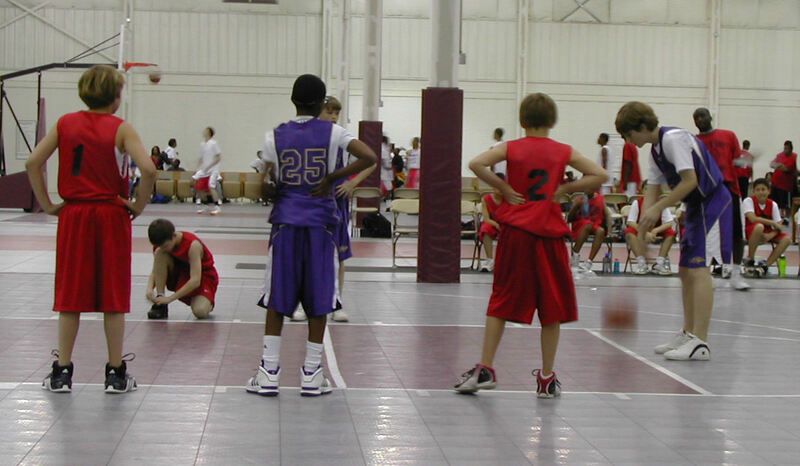 It is one the areas largest youth basketball tournaments, in the area. Games were played at the new Meadowbrook Sports Complex in Ellicott City and the Glenwood Community Complex in Glenwood. 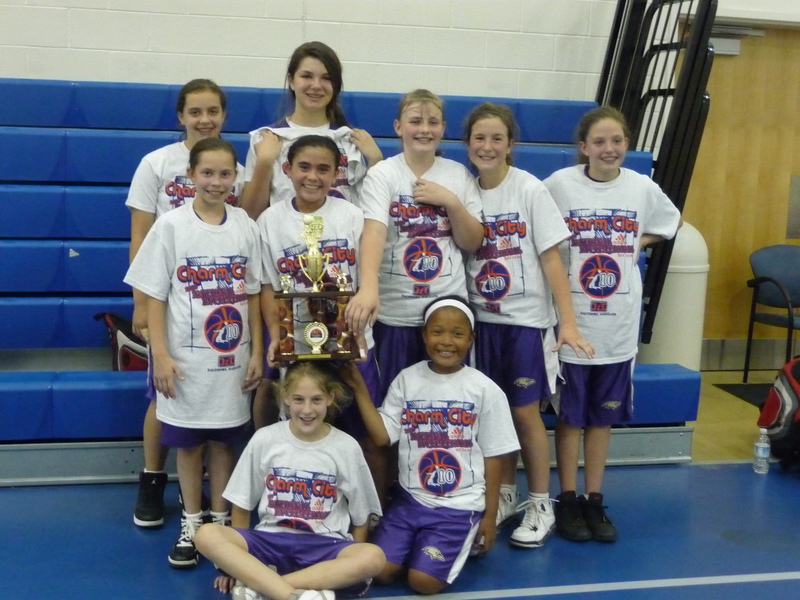 The Columbia Ravens Girls 10U AAU Basketball Team went undefeated and won the 10U Division Championship. Columbia Ravens 9U Girls followed up their Battle of the Balls Bluff Runner-Up finish last weekend with yet another 2nd place finish at YBOA State Championships this weekend. The YBOA States were played at The McDonogh School in Owings Mills, Md. The Ravens beat their first 3 opponents of the weekend 39-14, 19-2 and 38-22 before being knocked off by the Maryland Flames 9U National team in the Championship Game. That is two weekends in a row with a 2nd place finish and combined record for the season of 15-6 for our 9U Ravens. The girls hope to move up to Tournament Champs in their next tournament on June 5th and 6th. Youth Inc.'s Rebound Classic, in Ocean City this weekend. 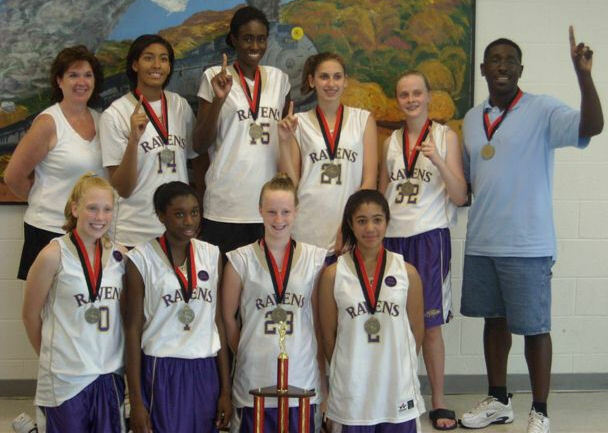 The Columbia Ravens U13 Girls basketball team win the Maryland State YBOA Championships for the second year in a row. In the first game the Ravens edged a talented MD Lady Clippers team 56-54. Down 3 with 13 seconds left in the game Imani Sanders was fouled on a three point shot and calmly made all three free throws to tie the game 54-54. Ann Kinsey rebounded a Clipper miss and was fouled with 5 seconds left in regulation and went to the line shooting 1 and 1 and made both to give the Ravens the victory. The second game the Ravens beat the Owings Mills Lady Tigers 54-34 behind strong defensive from Jenna Bergquist, Blair Bonner, Denise Whye, Amanda Miller and a excellent shooting performances from Lilli Robb, Sam Mocniak and Eve Lukowski. 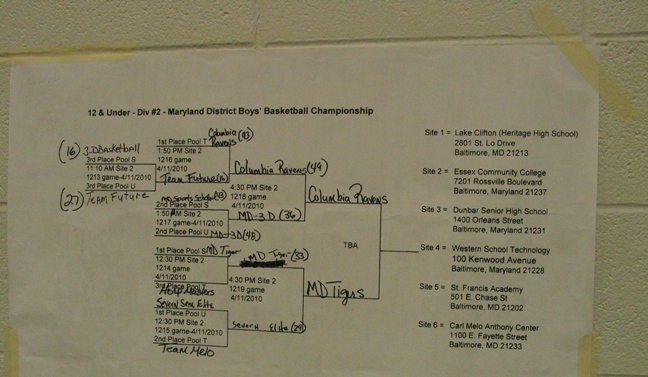 The Championship game was against perennial AAU Division 1 powerhouse the Maryland Flames-Baker team. The Ravens were noticeable undersized but their defensive intensity and determination was too much for the Flames to overcome. The Ravens were let by Anne Kinsey's 16 second half points including 7 of 8 from the free throw line down the stretch. Tremendous efforts were put in by Imani Sanders, Lilli Robb, Brittany Anderson, Nicolette Jennings, Katie Cheuvront, Eve Lukowski and Amanda Miller. Fans commented after the game that this was one of the best basketball games they have ever witnessed. The Ravens won by a final score of 59-52. The Ravens now look forward to representing the State of Maryland in the YBOA National Championship Tournament in Kissimmee, FL. in July. The Columbia Ravens 9U Girls went 5-0 this week in league and tournament play. 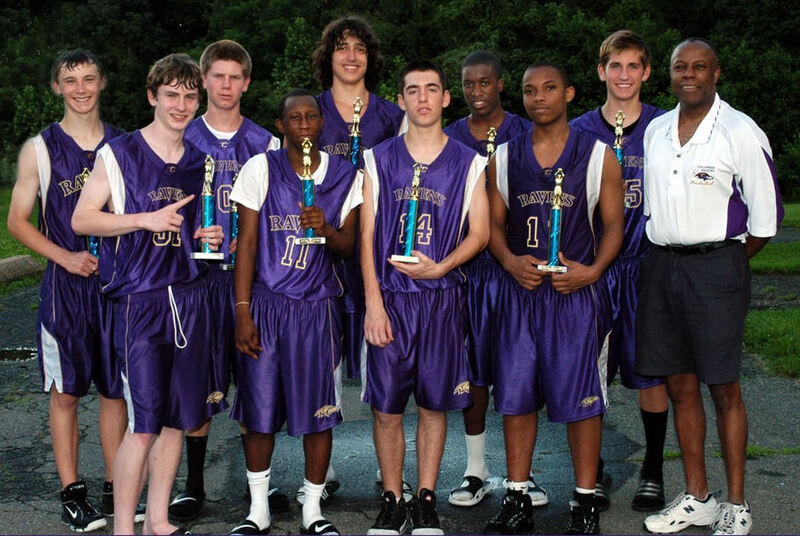 The Ravens were 3-0 at the Maryland Flames Summer Challenge claiming 1st place in the tournament held in Boyds, Maryland. The young Ravens defeated Queens Express of New York in the Championship game 21-6. Earlier in the tournament the Ravens beat Matrix of Virginia (27-4) and another Queens Express team (30-20). Selina Robinson-Clipper lead the way in the semi final game with a career high 13 points. In Sunday's Championship Game Jessica Foster and Courtney Furr had 9 and 10 points respectively to help the Ravens roll past the Express. The real story however was the stellar defense played by Emma Shettig, Ava Dennis and Bobbie Haney who swarmed the ball the entire game. Kelly Simons and Kelsey Ellis cleaned the boards to help get the fast breaking Ravens easy baskets with great outlet passing. The Ravens have another full calendar of games this week as they prepare for the Mid Atlantic Nationals held in Richmond, VA.
Congratulations to the Columbia Ravens 13U Boys. 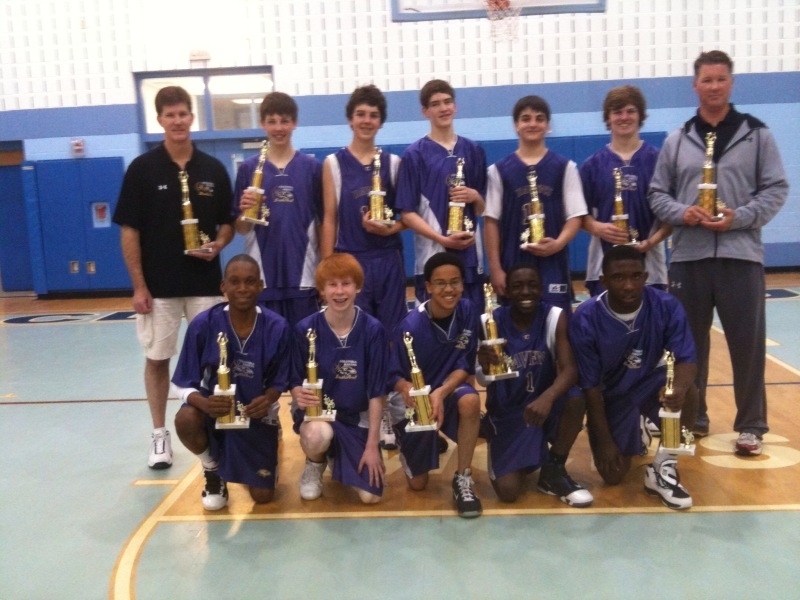 The Columbia Ravens Boys 13U team went 3 -0 to win the MD Flames Summer Challenge Tournament. Front Row: Nick Oates, Martez Beckett, Cleon Dickerson Jr.
Dennis Kelliher's team went undefeated in the Coaches Choice Inner Harbour Challenge which was a DII and DIII scouting event. On Saturday they defeated the Coaches Choice 13u team from New Jersey as well as the Bronx Lady Hawks 13u team from Bronx, NY. Sunday they defeated the B'More Hoopsters 13u team and our last game we defeated the Gaithersburg Lady Panther's in a nail bitter. The Score was 31-33 with 11.5 seconds on the clock. Zee got fowled and nailed both free throws to send the game into OT. Emma came through scoring the one and only basket in OT to win the game. John Miller's team placed 1st and Dennis Kelliher's team placed 2nd. Seated for Dennis' team: Zelor Massaquoi, Shannon Tyler, Allison Bluhm, Breya Wallace, Leah Hurst and Erika Faas (not pictured for Dennis' teams are Shannon Kelliher, Lindsey Williams, Emma Hoesman and Symrin Greenhow). The Columbia Ravens Girls are champions of the MD Flames Thanksgiving Tournament 10U division played at Georgetown Prep in Bethesda, MD November 20 and 21. The Ravens were 2-1 in pool play. In back to back games Saturday, the Ravens defeated MD Flames (Yeager) 24-6 and then fell to MD Flames (Rahman) in a hard fought game 20-18. Sunday, the Ravens defeated Westminster ATTITUDE 50-16 to earn a rematch with MD Flames (Rahman). In the championship game, the Ravens extinguished the Flames 15-10 to capture the title. The team was lead with tough rebounding by Grace Underhill and Sarah Hauk as well as great defense by Peighton Stone, Kelly Simons, Ava Dennis and Cecelia Bartley. Hannah Berquist, Madison Burris, Courtney Furr and Jessica Foster lead the team in scoring and combined for 6 left handed layups. In December, the Ravens start league play in the Arbutus and Central Maryland leagues.